This beautiful estate, reflecting nearly two centuries of York County history, dates back to the post - Revolutionary War period. The original house, owned by the Lint and Flory families, was a two an a half story brick on fieldstone, gabled structure. In 1840 a brick addition was built to the east side of the house. As legend has it a confederate army patrol actually camped on the front lawn after their futile attempt to cross the Susquehanna. Edwin Myers obtained ownership of the estate at the turn of the century. In 1901 Mr. and Mrs. Myers named the estate "Meadowbrook". Under the new ownership, a series of major architectural additions were incorporated into the original structure, bringing much of the charm we appreciate today. 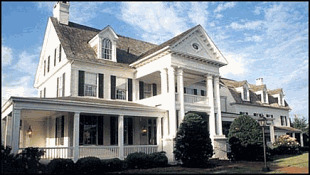 Mr. Myers commissioned the architectural firm of Hamme and Leber to construct the additions. Meadowbrook was one of the first major projects for John Bentz Hamme and Edward Leber, who started the firm just one year earlier here in York. Both men originally worked for J.A. Dempwolf, a York architect whose work includes York Central Market and Courthouse. Even with the additions, the Myers family only used Meadowbrook as a summer home. Until his marriage to Anna Iaeger in 1880, Mr. Myers had been a resident of York. He was an enterprising businessman with primary interests in tobacco, including wholesale leaf, cigars and cigar box manufacturing. In addition, he was Vice President of the York Valley Lime Company and served on the Board of Directors of York Telephone and City Bank of York. Today, reminders of Meadowbrook remain from the six colossal columns which frame the entrance portico of the front porch to the brass lighting, that still light The East Room on the first floor. Meadowbrook is a true piece of local history. We here at Christmas Tree Hill have enchanted the timeless beauty of this magnificent Mansion with home decor and furnishings to give that same feeling to your home. Each of our rooms features a different theme for the many decorating styles of today, making shopping here a truly memorable experience.